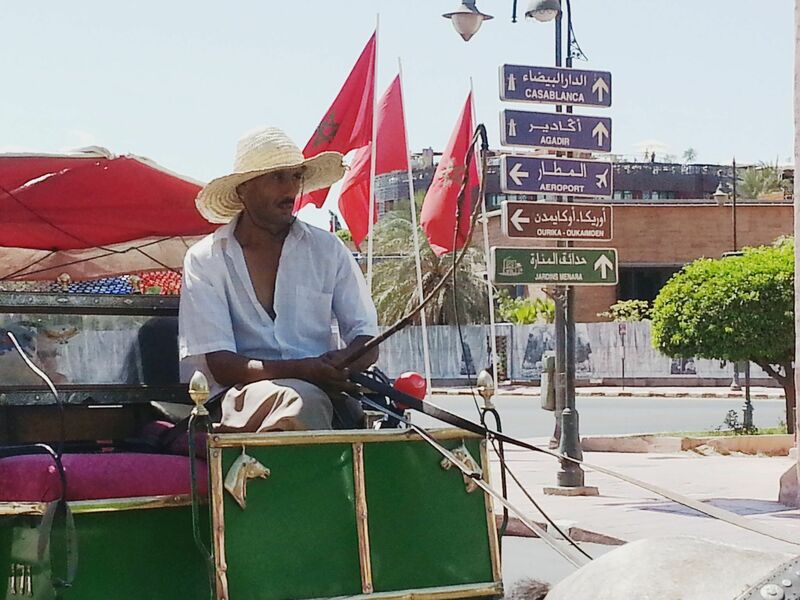 The local caleche drivers love showing children around Marrakech. A loft suite has more room for families at the Amanjena. A day at the Amanjena Resort in Marrakech is like a tour of the palace depicted in the tale “One Thousand and One Nights.” Simply put, it’s a more refined narrative of Arabian life than is usually available to the average traveler, even in the elegant and very Moroccan rose-red city of Marrakech. But that is the Aman way, exceeding expectations in service, design, comfort and decor at nearly 30 super luxe resort hotels in the world’s best destinations. Unlike classic Marrakechi luxury hotels known for vibrantly colorful mosaic walls and carved ceilings, the Amanjena is tranquil in the same way Buddhist temples are. People talk softly here. The lush rose of the Marrakech soil is used on the walls, highlighted with a mint, gold and sand tone in floor tiles. Sculpted stone fountains are strewn with pink rose petals. Moorish arches and subtle carved plaster scrolls decorate the public spaces. After a three-month refurbishment in late 2015, the resort was expanded to include a two-bedroom Maison Jardin unit plus new lounges. Even if you don’t stay there, design buffs will find the Amanjena worth a visit. The all-season Amanjena restaurants serve dinner by an onyx fountain surrounded by olive trees, with a colonnade that supports a retractable roof. In summer, it’s outdoors in comfortable chairs, overlooking an enormous, still pond. Formerly a city cistern to store water for the neighborhood, its sole job now is to mirror the Amanjena’s moonlit beauty. 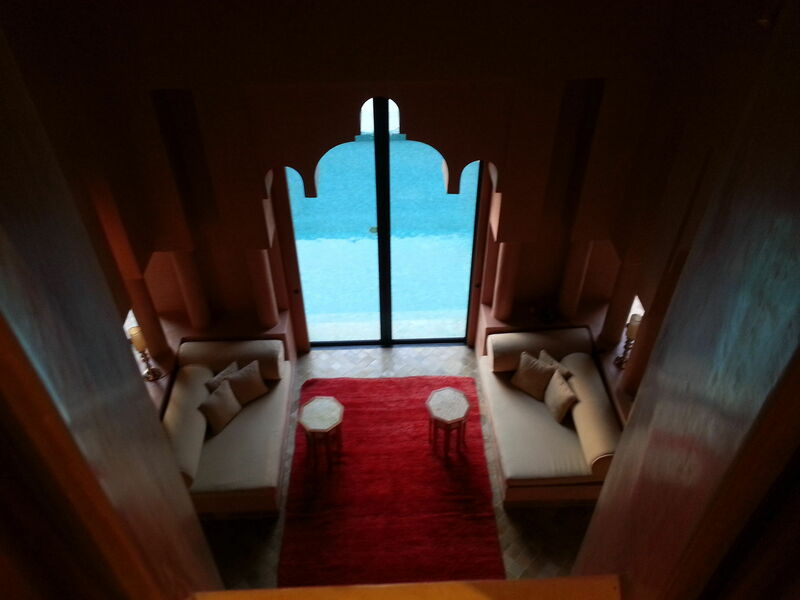 Surely the ultimate luxury in the midst of the great Sahara. There are two lounges off the reception area: one for cigars and shisha pipes in the evening, the other for afternoon tea and conversation. Designed by noted Moroccan Reda Amalou, each has a fireplace and intricate stained glass doors that keep them comfortable on chilly winter days. We began our evening as the sun set, when the resort comes alive with candles flickering in hammered pewter fixtures that produce a patterned glow. The live Arabic music alternates between a hypnotic chanter who spins a gold tassel on his hat in time to the rhythm, and a lyrical ensemble. The trio: lute player, drummer with a small bongo, and a violinist who held his instrument upright and bowed across its strings would be welcomed on any stage. Together they created what could have been an Irish or Gaelic folk song, one with the the syncopation of Middle Eastern music but without the jingley sounds of belly dancing. For dinner, there’s an izakaya style Japanese restaurant serving sushi and grilled food from the robata. The Mediterranean restaurant serves superb Moroccan food along with a delightful menu of dishes from Napoli, southern France and Andalucia. And romantics will want to arrange a meal at the private Caida tent. 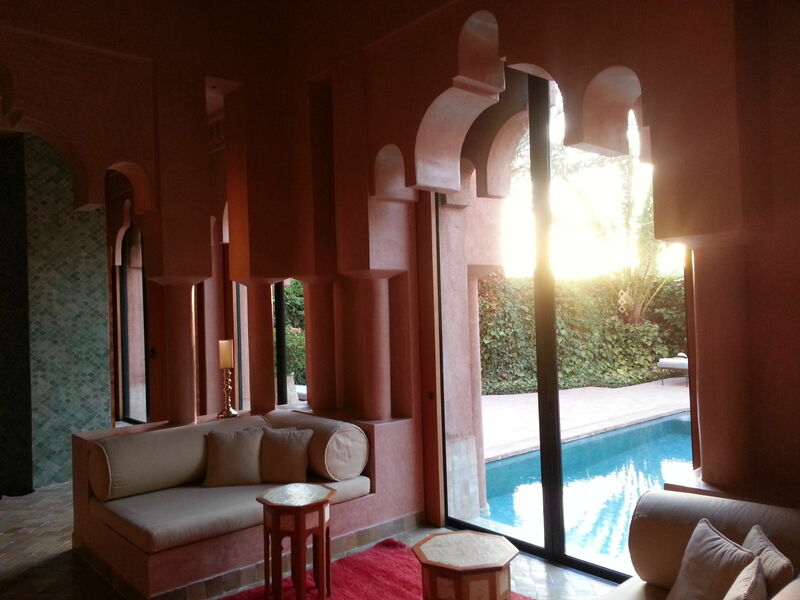 With 40 rooms and a very large property on the rue du Ouarzazate leading out of town, this is an exceptional haven for those who want peace and privacy. The small delicate spa has two Turkish style steam hammams. There’s a library, two tennis courts and loaner bicycles. The resort prides itself on arranging private guided tours of the Marrakech souk and medinas, hikes in the Atlas Mountains, even day trips to the Atlantic coast at Essaouira, so you may even choose to leave your room. During my brief tour of the hotel’s facilities I was shown a Maison, a suite worthy of the name “home.” Two-story attached villas, they have a large bedroom and bath off the dining room and sunken living area that overlooks a private pool. Upstairs is a master bedroom and bath, with a work space and another lounge with picture window views of the gardens. The quality of furnishings and decorative fabrics is exquisite; Berber carpets and zellij-tiled floors prevail. Pavilion rooms are on one level, carefully decorated with the same burled wood, a mosaic fireplace and low, cushioned couches. They have plenty of space to fit a rollaway bed or a crib but don’t have as much privacy as the duplex units. If relationship refreshment is the goal, these rooms work only for parents with a nap-a-lot infant or toddler. Should Children stay at the Amanjena? Surprisingly, I did see a few children under 12 at my summertime visit, but it’s not a place cut out for youthful frolicking. The standard (if anything could be called ‘standard’ at Aman) Pavilion rooms that have a garden or courtyard view do not have their own swimming pools. By day, unless they’re sightseeing in the fascinating UNESCO World Heritage souk of Marrakech, families will find themselves at the 33-meter-long reflecting pool that seems too still to ripple its surface. Nor does the wall-enclosed property have many areas to let off steam. That night, as I sat around a table of British dads working in Marrakech, I marveled at their family vacation stories. One father had taken the children to Egypt to learn scuba diving, another to a Tuscany farmhouse, a third to their family beach house in southern Spain, another to a resort in Tenerife, Canary Islands. They swapped tips about how to keep kids unplugged (disable the Internet and carry your own cellular modem) so they could reconnect to family for that precious few weeks of summer. As the moon rose and the candles were silently lit by staff in djellabas and babouches, the rose red walls began to lose their color. The Amanjena took on an other-worldly air, surprisingly beautiful and soothing. French children seated nearby, at supper with parents and grandparents, appeared to be sedated by the ambiance and in no rush to leave the mosaic-topped tables. Romance was in the air. Each of the men at my table said he could not wait to share Amanjena with his partner… and the children could stay at home. At Amanjena, the duplex Maison suites started at €2,230 per night, while the Pavilion rooms were €850, both with 20% taxes added. I was surprised to learn that room rates are the same year round; interesting because family vacationers will find that the summer school break is “low season” everywhere else in Marrakech. But Amanjena is unlike anywhere else. For more information, please visit the Amanjena page at the Aman site or contact your travel agent. Wish we all could have been there, Morocco looks fabulous and during the winter it would be a very productive coder’s retreat.